It’s that time of year again when we think about improving ourselves. I’m no exception. Each New Year brings with it the hope of a “New (improved) Me”. Perhaps for some, it’s dropping those extra 10 to 20 pounds that snuck up on you. For others, to Quit Smoking once and for all. We all have our own personal dreams of regenerating, rejuvenating, of drinking less alcohol, of drinking more water…. And, of course, Exercising. Sound familiar? For me, following through with goals can be a struggle. Honestly, even though I set admirable goals for myself, I could never seem to muster up the necessary will power to stick with it. 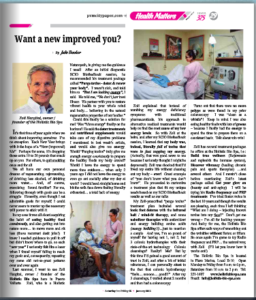 Click the image to read Julie’s article in Puerto Vallarta’s local news paper. In my case it was all about acquiring the habit of eating Healthy Food consistently, and also getting out into Nature more…….to move more and sit less (those recurrent desk jobs!). I knew I needed guidance to pull it off but didn’t know where to go, so each “new year” I seriously felt like a loser when I found myself failing to reach my goals and, consequently, repeating my same old not-so-great patterns over and over again. Could this finally be a solution for me? Was “More Energy” finally on the horizon? He said the Detox Treatments and Nutritional Supplements would take care of my Digestive problems I mentioned in last week’s article, AND would also give me ENERGY. Would “Purging Toxins” truly give me enough Energy consistently to prepare the Healthy Foods my body craved? Would I have the Energy to spend more time Outdoors….when only 2 years ago I did not have the Energy to even go out socially after my day at work? I would head straight home and hit the sofa face down feeling literally exhausted…..a total lack of Energy. Zoli explained that instead of numbing my Energy Deficiency symptoms with traditional pharmaceuticals, his approach to Alternative Medical Treatments would help us find the root cause of my low energy levels. So with Zoli at the helm, and after my SCIO Biofeedback session, I learned that my body was, indeed, literally FULL of toxins that were IN FACT zapping my Energy. (Actually that was good news to me because I seriously thought I might be depressed!) Zoli was shocked that I’d lived my entire life without cleaning out my body – EVER! Great example of “you don’t know what you don’t know”. He proceeded to customize a treatment plan that fit my unique needs based on my SCIO Biofeedback results as well as our talks. My Zoli-prescribed “PURGE TOXINS” treatment plan included several Ionic Foot Detoxes with the Infrared Belt/Mind-Fit Therapy, and some Nebulizer Therapies with Antioxidant and Energy Building Amino Acids (ENERGY BUILIDNG!! )…just to mention a couple. And yes, I’m so proud of myself for having not 1, not 2, but 3 Colonic Hydrotherapies with their state-of-the-art technology. Colonic cleansings? Really? Me? But by this time I’d gained a good amount of trust in Zoli, and after a bit of initial reluctance, I can personally attest to the fact that Colonic Hydrotherapy “FEELS…SOOOOO…GOOD!!”. After my 3 cleansings I waited about 2 months and then had a Colonoscopy. Turns out that there were NO MORE POLYPS as were found in my prior colonoscopy. I was “clean as a whistle”! Keep in mind I was also eating healthy foods with lots of GREENS – because I finally had the ENERGY to spend the time to prepare them on a consistent basis. Talk about win-win! Wondering if what Julie says is true?